Discussion in 'iPhone and iPad Games' started by AznChaos, Oct 5, 2008. OVERVIEW The invasion begins! Pint sized soldiers are storming your country - do you have what it takes to defeat them? Customize your strategic defenses using a wide selection of powerful weapons. Control the battlefield with a vast array of tactics against countless waves of unique land and air invaders! Countless hours of entertainment and replayable challenges! Enjoy a growing experience through DLC maps! 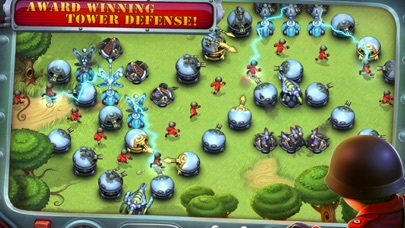 Do you have what it takes to stop the fieldrunners and rise to the top as the ultimate tower defense champion? KEY FEATURES • Retina display support for gorgeous artwork! • Addictive gameplay for hours of action! • Over 800 waves across 8 unique battlefields! • 11 devastating weapons for ultimate defenses! • Stunning visuals in a hyper detailed world! • Epic amounts of achievements! • Full Game Center integration! 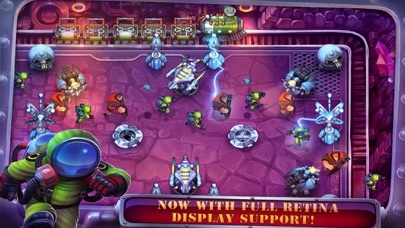 Experience the award winning tower defense game like never before thanks to full Retina display support! 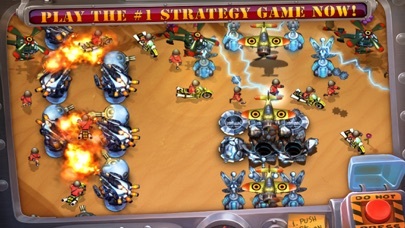 Stop the invading fieldrunners by creating mazes out of powerful weapons in this classic strategy game. Control the battlefield using limitless strategies and a diverse selection of upgrade-able towers! AWARDS • "Best Mobile Game Award!" 2009 IGF Mobile • "Excellence in Art Award!" 2009 IGF Mobile • #1 in “Top 10 Must Have Games” Gizmodo CRITICAL ACCLAIM • TIME Magazine - “Top 10 Video Games of 2008” • PC Magazine - "Must-Have iPhone Games" • EDGE Magazine - “Top 30 of 2008” • Boston Herald - “#3 iPhone Game of 2008” CONTACT SUBATOMIC STUDIOS • Twitter: @Fieldrunners • Facebook: facebook.com/fieldrunners • Web: subatomicstudios.com • Forums: subatomicstudios.com/forum • Email: info[at]subatomicstudios.com THANK YOU Everyone here at Subatomic Studios thanks you for playing our first game! 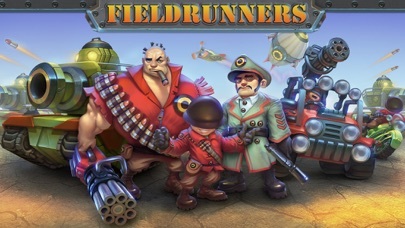 Please rate Fieldrunners to show your support. 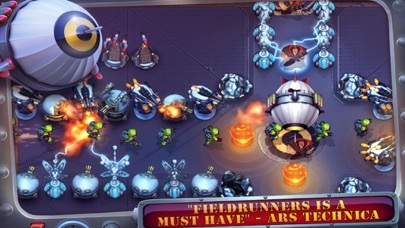 This is the biggest Fieldrunners update! Innovative new merger of tactical paths and open field based gameplay. Minor bug fixes and much more! Plasma tower: Creates a combo attack when it's projectile collides with another Plasma tower. Shotgun tower: Fires a devastating volley of drill bits in a large conical area. Lava tower: Incinerates all nearby fieldrunners in a giant wave of fire. i was actually just about to make a post about that game. I think I'm going to try it. I just got into Mote-M recently, but this game looks pretty fun. According to their site, they only have like four kinds of weapons. Mote-M might actually have better gameplay. I can't say until I try it, though. I don't understand why the maker of this game wouldn't put up a video of the game in action. I'm not going to pay 5 dollars without some sort of demo. Screenshots don't really do it for me. Has anyone tried this game out yet? Judging from the reviews - or lack thereof - I'd wager that we'll see a price drop soon. I checked out their website and the dev seems very responsive. They plan to add towers and they seem to be planning to add a Youtube video. I think I'll buy it now just because the dev seems dedicated to the game. He sounds like he's all about big updates. I went ahead and downloaded it and I must say it rocks. The graphics are colorful, the units are cool, and the towers are satisfying to watch. Mote-M was really cool, but this one really trumps it graphically. Plus, the developer has promised an update with a lot more stuff. Also, one of the runners looks a whole lot like the Heavy from TF2. Highly recommend. It's a very polished $5 title. Just got the game. Holy! Wow! I love this game. I'm a big fan of Adventure games....and Tower Defense! This game looks and feels polished. Its not a crappy bunch of sprites with a badly done photoshop job. It has an art direction, it has animation, it has polish. This game is definitely worth $5! Hey guys just wanna say thanks for the reviews. But for $5, is it really justifiable for someone who rarely play games? Aside from music, sounds, maps, are there rewards and things like that to keep you playing for more? Superb graphics and animations. Very polished and well done! Virus ain't too shabby either. There are no sounds or music and only one map, but the developer has promised them in an update. I played the game for about an hour and a half straight, and it allows you to keep playing long after Mote-M. Mote-M hits a wall around level 25 when the game becomes near impossible. My last playthrough of Field Runners I hit level 67. It's super addicting. If you don't play games much it's a tough call. It is super pick up and play gameplay, and the game saves your progress when you quit. It's really great fun, and it's not a Match 3, Sudoku, BrickBreaker game! So ... there's no sound/music in the current version? Thanks I think your post was directed towards me. Another thing worth mentioning is that you can resume where you left off of when you either quit a game, get a phone call, or hit the home button. Since, as lw1234 said, you can play for an hour or so, the ability to resume is important.